4Videosoft iPhone Photo Transfer 6.0.16 Free Download - Transfer all iPhone Photo to computer, transfer local photos to iPhone. 4Videosoft iPhone Photo Transfer is a professional transfer software, which can transfer all iPhone Photo to computer and transfer local photos to iPhone. Besides, it hehp you transfer photos between iPhone and iPhone. It can transfer photos for different iPhone/iPad/iPod devices, including iPhone, iPhone 4, iPhone 4S,iPhone 5, iPad, iPad 2, etc. After updated, it newly supports iOS 6, iPad mini, iPad 4, iPod nano 7, iPod Touch 5 and iPhone 5. Besides, the function of digital signature and contact have been added to it. 4Videosoft iPhone Photo Transfer allows you to transfer iPhone shot photos and camera roo to computer and iTunes directly. Besides, it can help you import local photos to iPhone for enjoyment. You can share photos with others by connecting multiple Apple devices to computer and transfer files between them. 4Videosoft iPhone Photo Transfer allows you to delete camera roll and picture you unwanted directly. The iPhone Photo Transfer supports all Apple devices: iPhone, iPhone 4, iPhone 4S, iPhone 5 iPad, iPad 2, new iPad, iPod, etc. Besides, this iPhone Photo transferring software highly supports iOS 6 and iTunes 10.6. There are four interface language: English, French, Japanese and German are provided for you to choose. 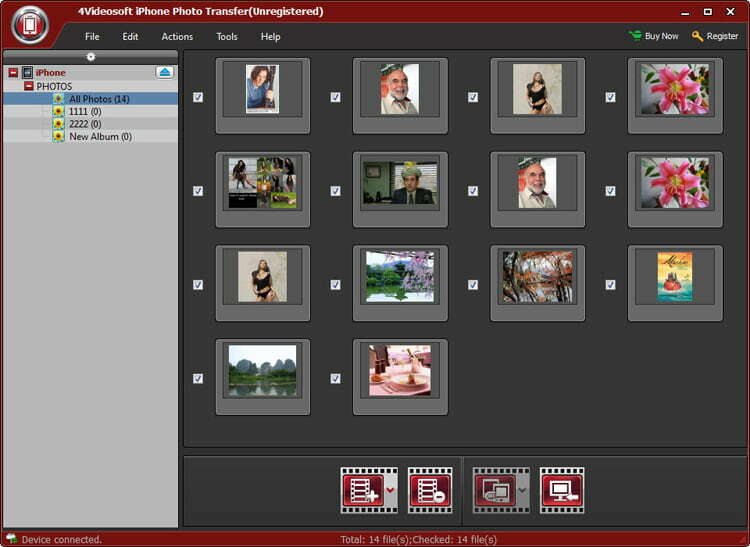 4Videosoft iPhone Photo Transfer is convenient for you to use with the intuitive interface and simple process. Statement: First, please download the orginal installation package by clicking the download link. Of course you may also download it from the publisher's website. Using 4Videosoft iPhone Photo Transfer crack, key, patch, serial number, registration code, keygen is illegal. The download file hosted at publisher website. We do not provide any download link points to Rapidshare, Hotfile, Depositfiles, Mediafire, Filefactory, etc. or obtained from file sharing programs such as Limewire, Kazaa, Imesh, Ares, BearShare, BitTorrent, WinMX etc. Software piracy is theft. If you like 4Videosoft iPhone Photo Transfer please buy it.